This pallet sign holder features a sturdy steel frame and flat base for stability. 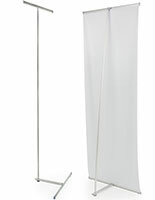 Each adjustable height fixture includes a 14.5" cross-bar style arm with two signage clips designed to allow fast, easy advertising messaging or price changes for a wide variety of media sizes. 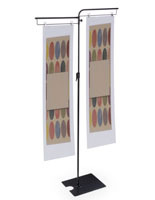 The commercial pallet sign holder is a great choice for use in retail stores or as an event accessory for showcasing marketing banner displays, as it is easily seen at a distance. The telescoping frame can be set to any height between 50" and 90" tall for maximum visibility in crowded public environments. 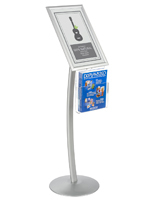 This 2-clip sign holder is lightweight and easy to move for convenience, while the flat steel base offers maximum stability and slides easily under other displays as needed to save space. The simple design of this adjustable height marketing fixture adapts to display a wide range of graphics of varying widths and lengths. This adjustable height sign holder with 2 plastic clips to graphics stands up to 90" tall, making it ideal for use in crowded environments such as trade shows, conferences, and promotional events as well as retail stores. The simple grip design for signage makes it easy to change banners and messaging as needed without taking the fixture apart. 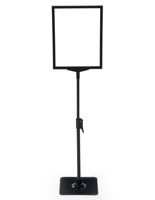 Each adjustable black sign holder can be used to display banners of varying width and lengths up to 90" tall as needed. 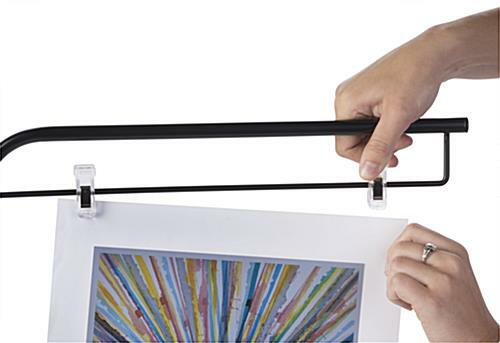 The portable, lightweight stand breaks down easily for travel to and from events and storage when not in use. Lightweight, but sturdy. Product was the right fit for having to put signage in a tight space. Thanks, Jennifer! We're glad that this sign stand was perfect for your needs. Please let us know if there's anything you feel we could improve — we always appreciate our customers' feedback. Perfect stand to display our poster at an upcoming conference. Perfect! We're thrilled that you'll be using this stand at your next conference. Thank you for the great review, Compassion. Order one as a prototype to test it out for signage at corporate volunteering event. It's lightweight. Clips make it versatile for many different signs (especially not limiting to a specific frame size). 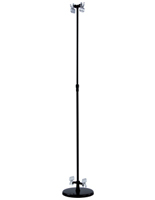 Adjustable height is spot on for many different applications AND it extends high enough to be seen over a crowd. We will definitely order more for event use. Designing our marketing material now with this sign holder in mind. Thanks for taking the time to leave such a nice review, Sandra. We love hearing that our products have worked out so perfectly for you! We wish you success at your events! I love this stand! 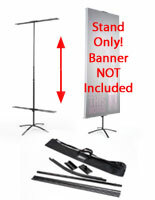 After many searches for something to hold my banner that would not break the bank, I came across this stand. It is sturdy, put together easy, easy to store and carry. My banner was a bit bigger than the expansion of the bar with clips, but I just added extra ties to the top bar. This looks great, Marchelle! We're so glad this sign stand worked so well for you! Thanks so much for taking the time to leave us a review and snap a photo! I work in the conference and event department of a college. We are always challenged to have signage that is visible to participants. Particularly in spaces we cannot hang signs on walls or from ceilings. Once you get more than a few people in a crowd or line, you cannot see what is on the sign if it is under 6ft tall. This sign standard gives us the option of going to 90 inches high. We love it! It is light weight, yet does not fall over. The bases also stack on each other so it saves in storage space. We have just started using them and hope they hold up to our heavy use. However, if we need to purchase more as replacements, the price is very reasonable. Highly recommend. This looks so great, Heather! We're so glad this sign stand works so well for you. We hope to work together again in the future! One of my internal clients loved them so much, I just purchased a few more. Posted one year ago by Heather N.